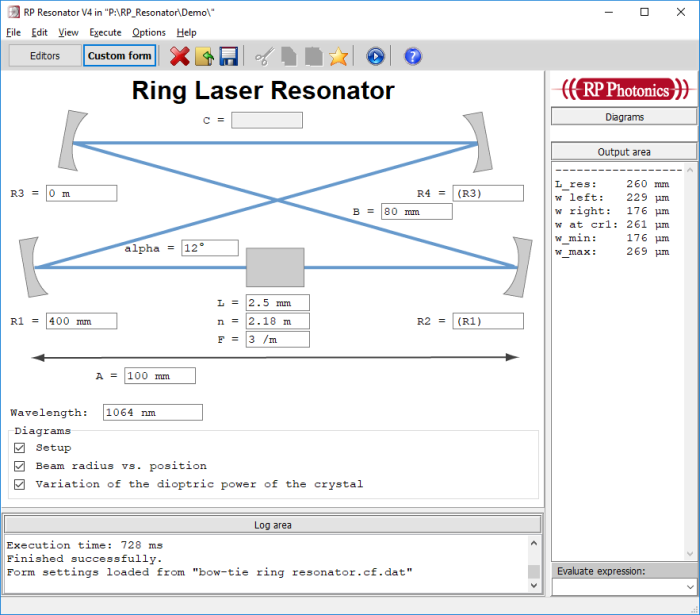 Custom forms in software from RP Photonics: forms which can be tailored to specific applications. Imagine: you can just buy a software license once and then get lots of different custom forms made by RP Photonics! In case that you run out of support time, you can simply buy some more support hours. This is an extremely convenient and low-cost way of effectively getting custom software for all sorts of purposes! Some users do not want to spend too much time on technical details. These can use custom forms made by others – for example, by their colleagues, or by RP Photonics within the technical support. For them, it is very simple to work with the software, utilizing only a graphical user interface: just put the input values into such a form, then “execute” it (e.g. by pressing F8), and you get the outputs displayed in the same form and/or in the generated graphical diagrams. Power users can make their own custom forms. It is not that difficult – see an example below. For an easy start, you can take some existing form and modify it. You will love these custom forms! They provide an amazing combination of flexibility and ease of use. As a power user, you will probably soon make custom forms for all sorts of purposes – possibly even outside the specific technical context of the software. The input values are stored in a separate data file. You can easily switch between different data sets. The software can also one or more graphical diagrams (not shown here) – just as you can get with any scripts. You can see here that it is not very difficult to define such a form. You could easily add some more input fields and get additional things calculated and displayed. Of course, all relevant details are well explained in the PDF manual as well as in the context-sensitive online help system. If you encounter any problems, you will get help via the technical support. 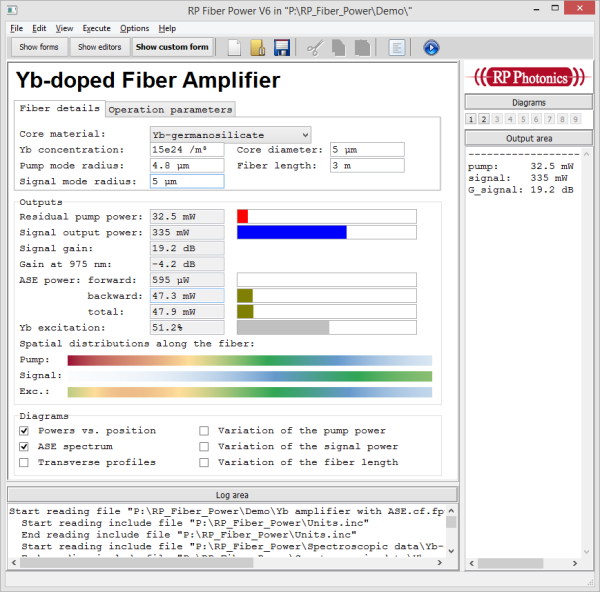 Several demo files for RP Fiber Power contain custom forms; they are designed for calculations on fiber amplifiers, tapered fibers, actively Q-switched Nd:YAG lasers, regenerative amplifiers, generation of parabolic pulses, etc. 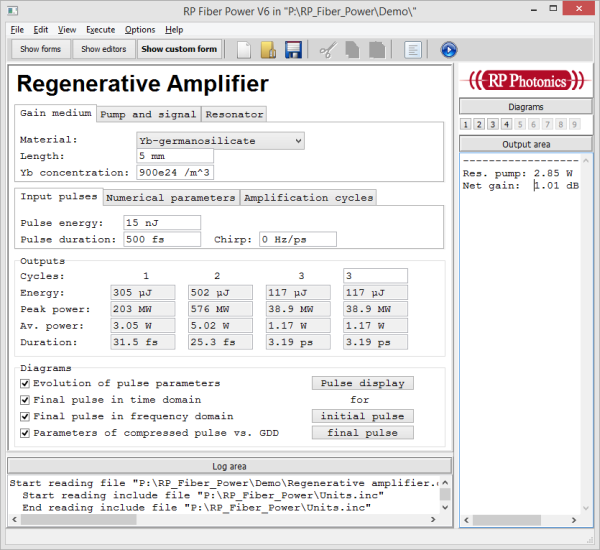 The following screen shot shows another example for custom form, made for calculations on regenerative amplifiers. This form is also provided with the software as a demo file. It makes extensive use of tab controls, allowing one to enter quite some number of inputs data and see output data on a limited space on the screen. 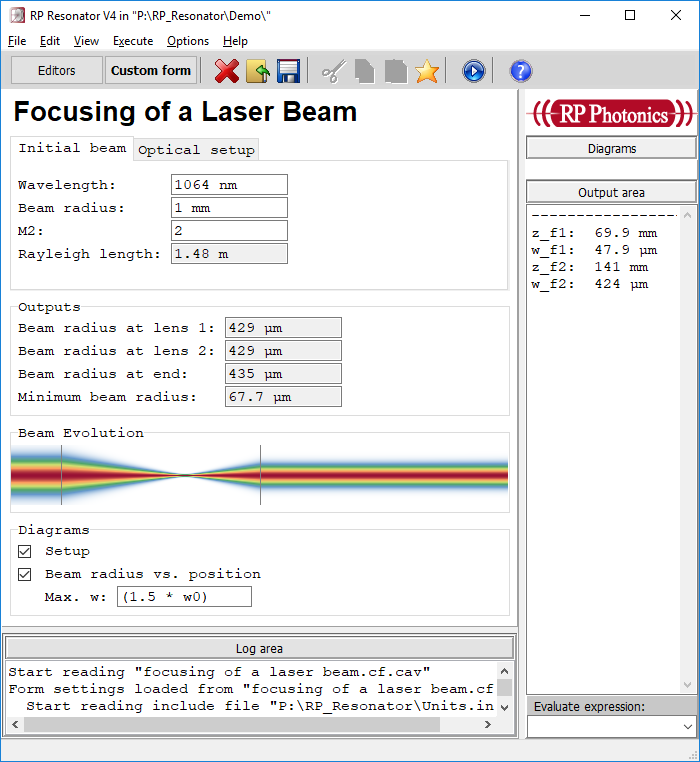 One simply enters the initial beam parameters, the focal lengths of the two lenses and their positions, and the software calculates the evolution of beam radius. It can even show the beam graphically, using the nice feature that images can be displayed where the color of each pixel is determined by a mathematical expression – in this case, using the Gaussian intensity profile with a z-dependent value of the beam radius. Here, a background image is used, and the input fields are positioned such that the user immediately sees to which arm length or angle some input corresponds. 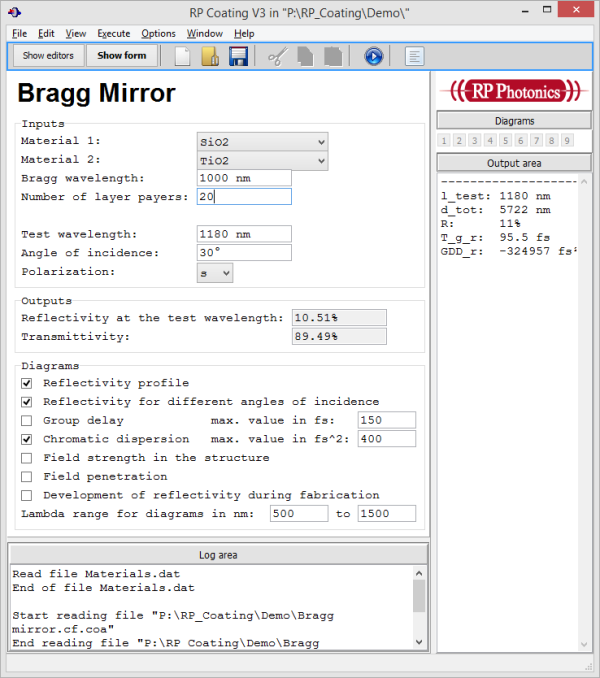 This example concerns the design of Bragg mirrors with the software RP Coating. Here, you can choose to optical materials and enter parameters like the Bragg wavelength and number of layer pairs. You can produce different diagrams, for example showing the reflectance profile for different angles of incidence. All input and output values can be nicely formatted, e.g. rounded to some number of valid digits and with proper units. For example, the user may simply enter “1.53u” into an input field for an optical wavelength, and the software will turn that into “1530 nm”. Input fields can be made such that all outputs will be immediately recalculated when such an input is modified. There are certain function keys with which you can ramp values up and down with different step sizes. Multiple fields can grouped into a box with a border and some heading text, or into tab control containing multiple tabs. (For example, the screen shot above contains the tabs “Gain medium”, “Pump and signal” and “Resonator”.) In that way, you can have a lot of input fields without occupying too much space on the form. (You may even have nested tab controls, multiple boxes within a tab control, etc.) However, you can also just make a very long form, and the software will provide a scrollbar for accessing all parts of it. For inputs, there are not only the usual text fields, but also combo boxes and radio buttons (for selecting values), track bars and check boxes. Output fields can be text fields, but also one can have colored bars, where both the length and color of a bar can be calculated. For example, make a bar which graphically indicates what percentage of pump power is converted to signal power, or which turns from green to orange or red once the fiber might get overheated. For text fields, the text color and the background color can be calculated. For example, you can change the color of a text field as soon as some value exceeds a certain limit. It is possible to display images (loaded from files) in a form – for example, as background images or for illustrating certain input fields. Alternatively, the image content can be calculated, using a mathematical expression which defines the color for each pair of x and y coordinates. One can create buttons with which additional functions can be accessed, e.g. saving some results to a file. It is possible to save multiple input data sets into files and load them back into the form later on. So you may easily switch between parameter sets for different fiber amplifiers, for example, while still using a single script defining the form. In versions made since 2017, you can use arbitrary Unicode characters in custom forms; they will be properly displayed and always so why if saving to a file and loading it back again. Due to such features, it is a real fun to work with this software! Also keep in mind that custom forms are in no way limited to some specific set of calculations. The script language supported by our software is extremely powerful and allows you to implement basically any calculations. So you may start using such custom forms even for calculations totally outside the technical context of this software or even outside the area of physics.